One of the plants that just goes on surviving thru the heat and one of the few plants that the wallabies don't like to eat are my chilli plants. I don't have many - just 4 - but they are ample for my needs. I always grow chillies cause I think they are so beautiful in the patch and because I like my food spicy. 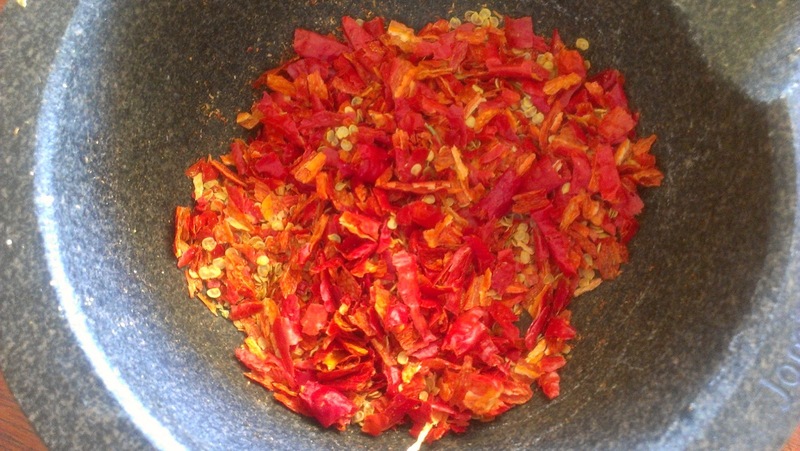 Last year I preserved my chilli harvest in a number of ways - by making my rocket fuel recipe, a tomato and chilli jam recipe, by pickling in two different ways and by freezing some for winter use. 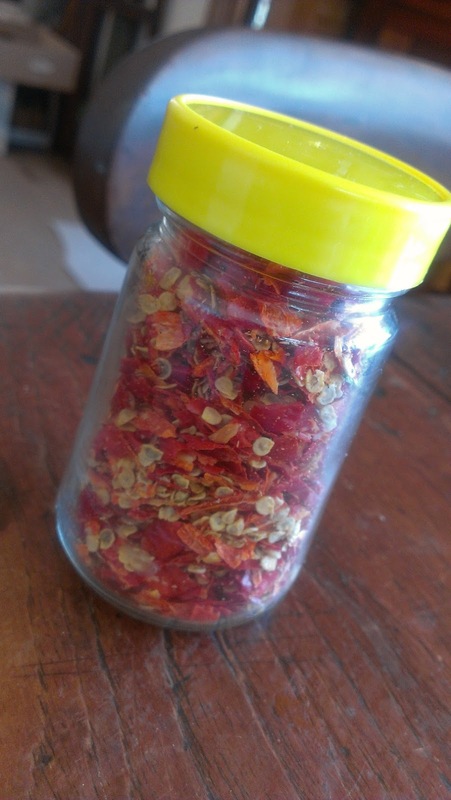 I still have plenty of jars of these left so I decided to take advantage of the dry heat to dry some chillies for making chilli flakes. With the drying over I ground the chillies up yesterday in my big mortar. 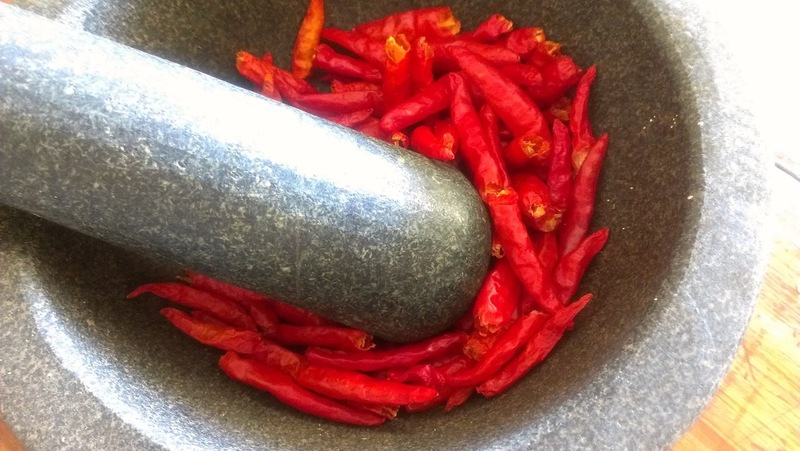 I like the slight sting in the nostrils while grinding the chillies (dont rub your eyes Louise!). I like the jar of chilli flakes that results! How are you preserving your chilli harvest this year? i haven't had a chilli harvest yet, just a couple of cayenne's. The rest are still about a month away. I have two jars of sambal left from last year but mum wants one so i reckon most of it will into sambal to spice up my food while keeping the kids' relatively plain. My long cayenne just failed this year,it's such a shame. They are the prettiest of them all in the patch I think - save perhaps your little scotch bonnets. I dry my chilis too, and make chili jam when the lemons come on, but that's a bit later. Right now I'm making hot mango chutney and tamarillo and chili sauce. I also pickle some chilis later in the season too, so as to have some for winter - pickled chilis on a platter with apple and cheese is a treat, and they're good for adding a bit of spice to winter stews. I've ajust made a batch of Kasundi and I'll get round to posting the recipe soon, and I'm thinking about a batch of curry paste. I am really liking the idea of the tamarillo and chilli sauce. Love pickled chillies and am looking forward to your kasundi recipe. Man, those dried chili flakes are beautiful in your jar! They are pretty aren't they? Love the colour of red chillies. They warm you up just looking at them.